Phew! That old adage, time flies when you having fun, is so true! Since my last post Lesley Rochat Adventures together with Shark Warrior Adventures have resulted in the last 12 months being super busy as we developed new projects and got on with sharing them with hundreds of others. I’ve said it before, and sorry if you’ve heard it before because I do go on about it, but here it goes again: I believe that our greatest mistake, and reason why the world is in such turmoil, and why the environment and all of Nature is suffering so dreadfully, is because we have disconnected ourselves from Nature, assuming we are superior, forgetting that we are in fact a part of Nature, and that when we harm other life, we harm ourselves. To this end, my goal is to help others to reconnect with Nature and this I do through my Internships in Conservation Wildlife Photojournalism, my Leadership Courses, photographic dive expeditions, and through all our ocean adventures, which is run from Shark Warrior Adventure Centre in Seaforth. I have successfully run three internships (I only run 2 a year, maximum of 12 students per year), and a Young Leadership Course, while the Shark Warrior Adventure Centre, since we officially opened in November, has introduced close to 400 people to the wonders of the ocean, above and below the waves with sea kayaking, snorkeling safaris and Stand Up paddling adventures (Book here). I am super proud of what we have achieved! Our self funding initiative for AfriOceans continues to grow and soon our Swim like a Shark programme will take off again. In the meanwhile Terry Corr, our Head of Education at AfriOceans has been doing amazing work helping to protect the endangered African Penguins in partnership with WESSA, and behind the scenes we are working on raising funds for other much needed projects. Then there’s Soulmate by the Sea, my holiday accommodation which I began to share with travelers from every corner of the globe. They either book in to spend some time with me, sharing the wonders of the ocean with them, or just travelers looking for the peace, tranquility my beautiful home offers. I have met so many wonderful people and made new friends, it has been awesome sharing my special spot overlooking the ocean with so many. 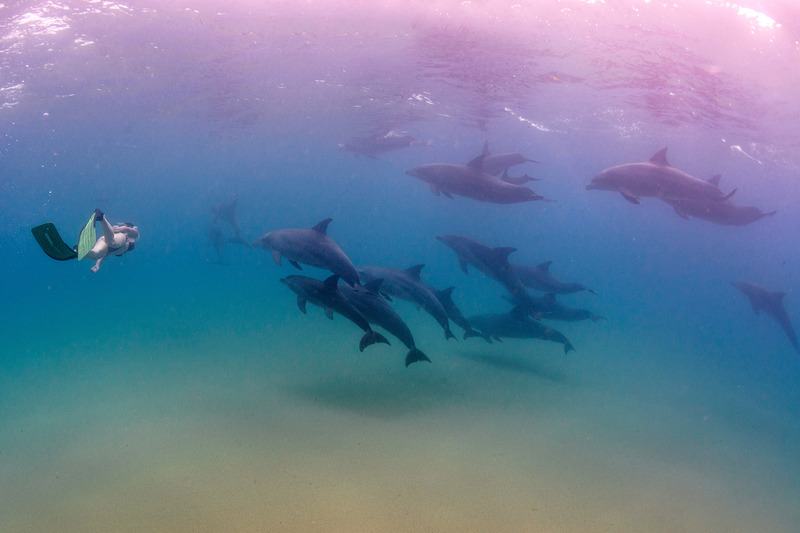 This year has been a busy one so far, I’ve just returned from diving with dolphins in Mozambique and off to dive with sharks in the Bahamas soon (thanks to Casey Delange for the super photo of the dolphins and me), and it will continue right into the next. If you’re keen to join one of my adventures check one of these highlights out: May Conservation Wildlife Photojournalism with Environmental Education internship course, and December Conservation Wildlife Photojournalism internship course (applications only), the Sardine Run expedition in July, the Predator Expedition straight after the sardine run, and more dolphin diving squeezed in somewhere. Overall I am feeling very blessed and in love with life! I can’t wait to keep sharing my passion with people from all over the world, and helping to inspire others to create the lives they dream of, and at the same time empowering them to become the voice for those who cannot speak!